These mighty ships were driven by turbine engines that drove four screws, thus reaching speeds of up to 20 knots. The Alsatian offered accomodations for 1,750 passengers and 500 crew members. The luxuries included a loungs, library, reading room, card room, smoking room, gymnasium, and spacious sleeping quarters. She also had a closed promenade deck for recreation in bad weather. That the world was on the verge of entering a great war in 1913 was clearly evident in that the Allen liners were equipped with both wireless telegraphs and the latest in submarine signalling equipment. Just what this equipment was is not clear in the old news reports. Alsatian was quick to join the war effort. She served as an armed merchant cruiser from August 1914 until December 1918. During this time she helped rescue the crew of the Oceanic, a White Star Liner that wrecked in September, 1914. 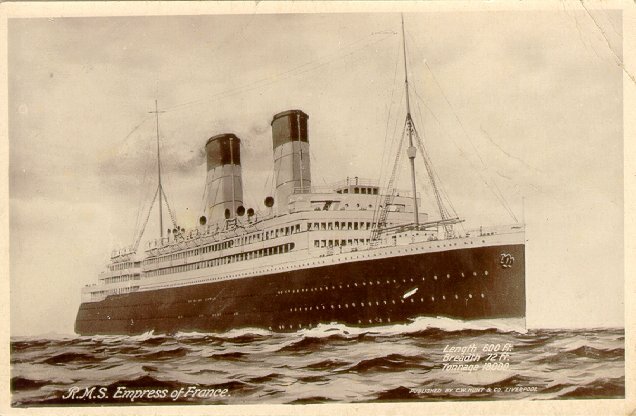 When the Allen line was sold to Canadian Pacific, the Alsatian was given a refit and renamed Empress of France. The ship made her final voyage from Southampton to Cherbourg, Quebec in September, 1931, and was laid up. The great depression had caught up with her as it had so many other fine ships. She was scrapped in 1934.